You save £11.00 that's 55% off! 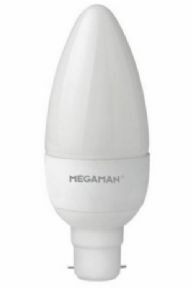 This energy efficient 3.5W retro-fit Megaman LED Candle (frosted finish, large bayonet b22, white base) delivers a warm white light (2800K) and brightness, similar to a 25W - 40W filament incandescent bulb. Although packaged as a 25W replacement after internal testing in most situations this would be suitable as 40W halogen replacement. With instant on technology meaning there is no warm up time and wide beam angle this an ideal LED equivalent to many traditional candle bulbs.